Tom & Robert, welcome to the forum. Thanks for taking the time to make the introductions. My name is Rick, I live in Keene, New Hampshire, in the southwestern corner of the state. I have been model railroading in one form or another since I was about 4 years old..... that would be well over 50 years now! Did all the usual, Lionel, 4x8 HO, O Scale, On3, even dabbled in N when it was basically a new thing. I have finally "settled" on On30 (with a little On18 thrown in), along with 1:20.3 Battery and Live Steam outdoors. My interest is first half of the 20th century, shortlines/logging/industrial with a Northeastern flavor. I really enjoy kitbashing and scratchbuiding rolling stock and structures. I think this is an awesome site and I'm really glad to be here. Thanks for having me!!! Welcome aboard, Tom. Robert and Rick. It's interesting to hear your backgrounds and modeling interests. I'm Ronald Halma, 48, married with 2 children and 1 grandchild. Modelling in H0, 0N30 and the newest one in 1:55n3. 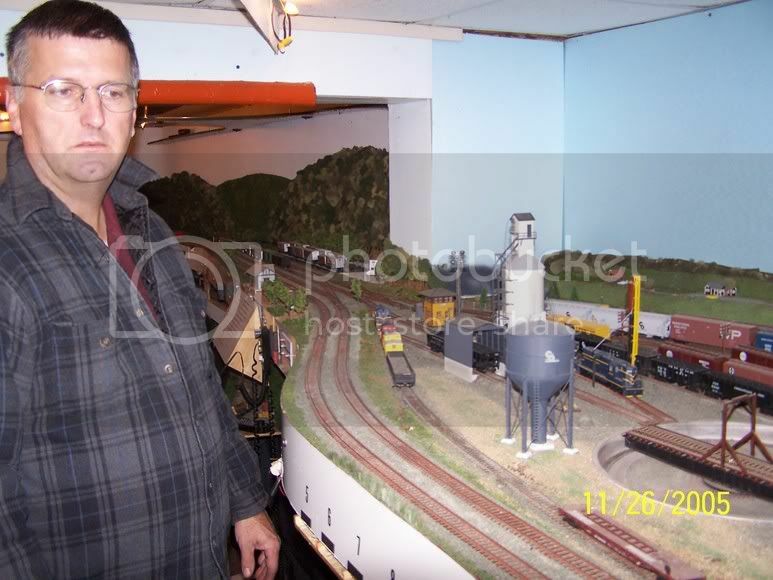 What I do the most is building American themed layouts for trainshows. I started in 1999 with my first layout Metusa Junction which was demolished in 2007. After that first one I build from 2004 on 3 more in H0 and 0N30, and the newest one is in 1:55n5 and almost ready. The theme of that one is American Civil War and it is called "Kennesaw GA 1863". The most of that is handbuild except for the loco, that is a Bachmann 4-4-0 off the shelf. Well, I will start a top about that layout. Furthermore I will see around here, so I hope we speak each other! I live in the Thames Valley just 25 miles from London. I started in US outline in 1993. My wife and I rode the Durango and Silverton and she said would I like a souvenir of the ride? By the time we arrived back in the UK I had an extra suitcase of model trains!! I freelance - my layout room is 20 x 30 and the first layout was named the Sierra Nevada - modelling mainly western roads. It was featured in Continental Modeller a few years ago. Recently I renamed the layout the Eastern & Great Lakes to reflect my interest in eastern roads and whilst the track plan remains the same everything else is changing. I model in HO and my favourite part of the hobby is structure building. Electics is my least favoured pastime so I went DCC from the start. Besides my home layout I also have a show layout - Mill Falls - my interpretation of New England - basically 24 craftsmen style kits in a scenic 9 feet. It has been shown over 30 times and is usually the sole US outline layout at British model train shows. I am also involved with my local club and have built almost all the structures for two show layouts Prospect Valley (featured in Continental Modeller and recently a French railway magazine) and Prospect Point. A short video on Prospect Point is available on U-Tube. Ronald and Mike, welcome to the RR-Line Forums. Please feel free to start threads on any projects you may be working on or jump in and get involved in one of the ongoing threads. Welcome aboard, Mike. I enjoyed the video of your layout. Those are great looking buildings. It's nice to have a wife who supports your hobby. Who carried the extra suitcase? I am new to this forum. I am into model railroading since almost 50 years now. Started with HO AC (M�rklin) and after a few years, changed to HO DC because there were more Belgian prototypes available. Then after a house move did HOm (Bemo) and later on n-scale American prototype.After I had a house with a garden I went outside with 45 mm gauge (LGB, Bachmann, Aristo, USA-Trains). Then I moved again to where I live now and started construction of a 19m x 12m L-shaped layout in the garden.While I live near the coast I had the mishap of a storm demolishing 90% of my structures and also some of the track and 10 switches who were a total loss.I don't give up so easy and am planning rebuilding coming summer, but I will have to secure everything more firmly to the ground. Meanwhile I stumbled on this forum January last year and after seeing the wonderfull work of the members I decided to build a On30 layout under the roof. (7 m by 4 m).I cleaned out all my 45mm boxes and started to design a plan. I allready aquired some locos and rolling stock aswell as some laser-cut kits. I was lucky that I could get a full trailer of 1"by4" wood for free, so used that to construct a table around the walls. Plywood is already cut and in place and now comes the big work for the winter project. I think I will call the railroad "Costa y Sierra" but am not sure yet. Glad I am finally here. Welcome aboard, Eric. Keep us posted on the progress of your new layout. Thanks for taking the time to introduce yourself. I am a newbie to the forum and model HO scale in the 50's. My layout is loosely based on the SP in the Sierra mountains in California. Hello Everyone !! I am MedCityBob (or Bob Danielsen) of Rochester, MN. Hence the Med City as we are home to the famous Mayo Clinic. Welcome aboard, Russ and Bob. Thanks for taking the time to introduce yourselves. Hi, my friends call me Les.I live in Delaware, that is the state that everyone thinks is part of Pa.I was born in WV and model WV. I was 2 years old when my father bought me an American flier for Christmas. I still have some of it. Oh yeah that would have been a few years ago well maybe a lot of years ago. Anyway in 96 I decided to build my dream layout in HO. It is a little less than 500 square feet. I model Chesapeake & Ohio in the late 40s. Naturally in the mountains of WV. I enjoy all aspects of the hobby except trouble shooting. I have been using MRC Prodigy advance DCC for close to ten years and love it. I went wireless about three years ago.